Sitting down to do your business in the bathroom, you don’t usually expect your toilet to be loose and rock back and forth. In fact, nothing feels less secure in this room in terms of sustaining an embarrassing injury. Fortunately, a rocking toilet isn’t going to cause you much personal harm, but a loose, wobbly toilet is still something you should fix. This is actually kind of important since it can eventually lead to sewer gas leakage or worse, a water leak that can damage your home. Most of us haven’t ever removed a loose toilet before or even have a clue how it’s done. So, fixing a rocking toilet by say, replacing or repairing a broken toilet flange may seem daunting. Don’t despair, if you tackle this problem with a mindset that all you are doing is fixing your wobbly toilet, then you can focus on that task and accomplish something you never thought imaginable in a do-it-yourself project. So without further ado, let’s see what may be causing your toilet to be loose in the first place and how to fix it. Your wobbly toilet may be moving because the mounting bolts that hold it down have nothing to grab onto anymore. You might think your loose toilet bowl is held down to the floor by a couple bolts. While this is true, you should know that the bolts don’t go directly to the floor. Instead, they secure to a toilet flange. Think of this flange as a strong metal or plastic ring. It’s this piece that is bolted to the floor, and also sometimes secured to the drain pipe called a “bend”, which is made of sturdy iron. Now, you might get lucky and just be able to tighten down these bolts, but if the bowl is rocking or has been for a while, it’s time to take a look at the flange underneath. In this how-to article, you’ll need to start with lifting up your loose toilet from the floor. This isn’t so bad, just be sure to turn off the water supply valve first. Next, give it a flush to drain the bowl water. And finally, undo the bolts holding down the toilet. Fix the broken or cracked toilet flange or replace the broken flange altogether. This is usually the more popular choice mainly because it is easier and can really do the trick if your broken toilet flange is iron or metal. The part you’ll need is an adapter called a super flange or spanner flange (see here). 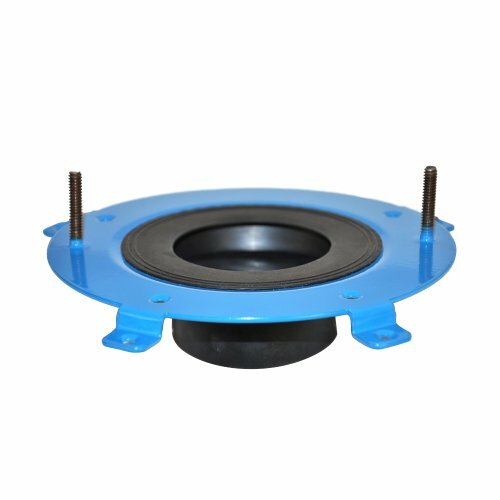 This is a semi-circle piece that fits over or underneath your broken toilet bowl flange. It’s job is to provide a new hole for the mounting bolts to hug onto. Pick one of these up (or two if you discover that both sides of your toilet flange are broken), using the previous link or visit your local hardware store. Follow the directions, and your rocking toilet will be solid again. You may be one of the lucky ones who finds that their broken toilet flange is beyond repair (e.g. is cracked or split into several pieces), or that it is old and corroded. Again, this isn’t a terribly difficult task. A new toilet flange will give you years of solid toilet mounting. Assuming again that you’re now looking at your broken toilet flange, you can remove it by unscrewing the bolts (there should be three or four depending on the model), that hold it to the floor. In older, vintage homes, you may not have any bolts holding it down as it was secured with lead (molten when poured in around the bend pipe). If this is the case, you’ll need to use a chisel and hammer to break the iron flange out of position. Be very careful not to damage the main pipe, called a “bend”. After removing the broken iron flange, simply place in your new toilet flange. Models with rubber gaskets (seals) and brass rings will be the best here. Just make sure the flange is flush tight with the top of the floor, otherwise your toilet will wobble. Follow the easy instructions that come with your product, being sure to tighten each of the four bolts a little at a time so the rubber gasket goes down evenly around the bend pipe. Don’t forget that whenever you lift up your toilet, you’ll be breaking the wax seal that keeps water from leaking. Simply clean off the old one and insert a new one. Or better yet, replace with a wax free seal for cleaner, better installation. Probably the easiest fix, your loose toilet may simply be due to your loose toilet mounting bolts needing to be tightened. 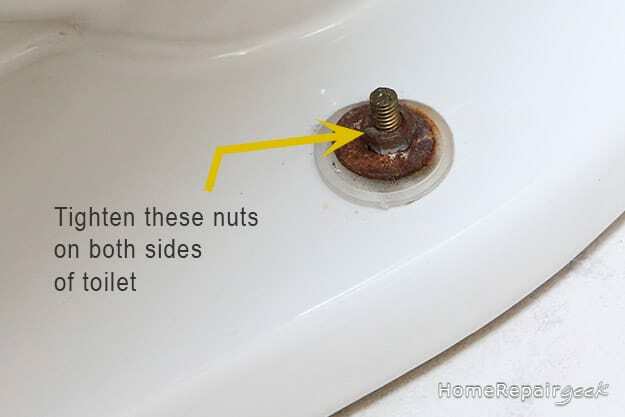 Simply remove the small plastic bolt caps at the base of your toilet (they will be on each side, and can be pried off with a small screwdriver). You’ll see a nut, and it should be unmovable with your fingers. If either of these nuts is moving, tighten them down with a socket wrench. No need to be as tight as your muscles can muster, since the material your toilet is made from can crack under too much strain. If these bolts are actually broken, however, you’ll need to replace them. 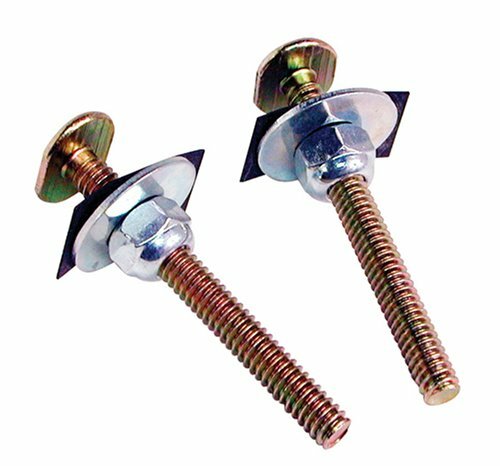 The bolts can be purchased by themselves, so don’t feel like you need to buy a whole toilet flange repair kit. Just remove the old bolts and insert the new ones. The best kind will be made from brass. To do this correctly, you’ll have to lift the toilet from the floor, so you will need to purchase a new wax seal to replace the one you’re breaking apart by removing the toilet. This will be a good time to inspect your toilet flange too. Your loose toilet troubles could be related to the way your toilet was last installed. This can happen if you have your bathroom floor redone, and the level or height of the floor changed. If this is the case, check that the installer didn’t shim the toilet to raise it up. This is not a solid install and can easily lead to a toilet that moves when you sit down over a short time. Follow the instructions for replacing a broken toilet flange. You may have to carve out some of the tile or other flooring around the edge of the drain hole. This makes it so that you can place a new flange down into the hole since the old flange may have been positioned higher for the old floor. As with any do-it-yourself project, if fixing a loose toilet seems complicated and you wish to hire a plumber, at least review this article so that when the plumber explains the problem you’ll understand more what he’s doing. At the very least, knowledge is power when it comes to anything plumbing. You can even inspect that it’s done right and ask educated questions so that your rocking toilet doesn’t return any time soon! The BEND is ¼” to 1/3” above (rear) & 5/8″ above (front) to the floor. Can I push the front down and place a plastic wedge between the floor & the flange in the rear to level out the flange/bend, then put Hardy Backer ¼” to ½” on the floor to reduce the gap remaining? OR, will this cause water leakage between the foundation & the floor? The plumber said it was a $200 repair. My husband doesn’t want to mention this to his dad (dad owns house). I do all the repairs with much success. This one has me stumped! Or is the plumer the way to go? I need this information ASAP before the new flooring is installed in the week of 1/25/10. Good advice for really simple problems. Try and find yourself some Johnny Shims. Plastic shims designed specifically for toilets and pedestal sinks. They have little saddles that lock and hold them in place, and you just lift and snap off the exposed portion. I have just gutted my bathroom, and had a man lay hardboard and tile. This leaves my floor flange just a tad higher than the finished floor. I’m going crazy. 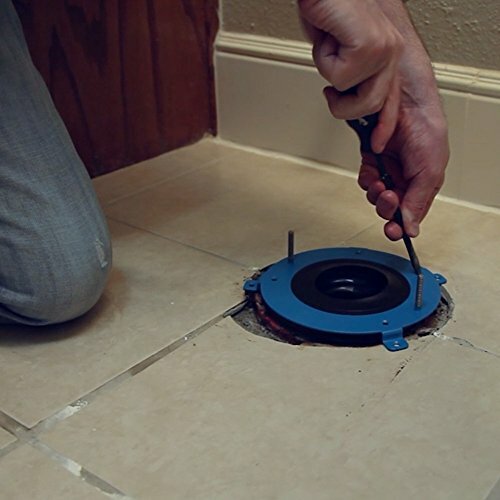 One guy says flange should be 1/4″ above finished floor, while another says 1/4″ below. Right now, I am about 1/8″- 3/16″ higher than finished floor.